Canine glaucoma is expressed as an increased pressure within the eye. This elevated intraocular pressure causes damage to the retina and optic nerve. Pressures that are significantly elevated (>60mmHg) can cause permanent vision loss in less than 12 hours. A blockage to the normal drainage of aqueous humor (fluid within the eye) causes the high pressure to develop. The obstruction may be primary, meaning that there is an inherited predisposition to an abnormally narrowed drainage angle. Breeds that are prone to primary glaucoma include the Cocker spaniel, Basset hound, Siberian husky, Shar Pei and Standard Poodle. The blockage may also be secondary, which means that the obstruction to drainage is caused by another underlying condition including abnormal lens position, intraocular inflammation (uveitis) or a tumor. 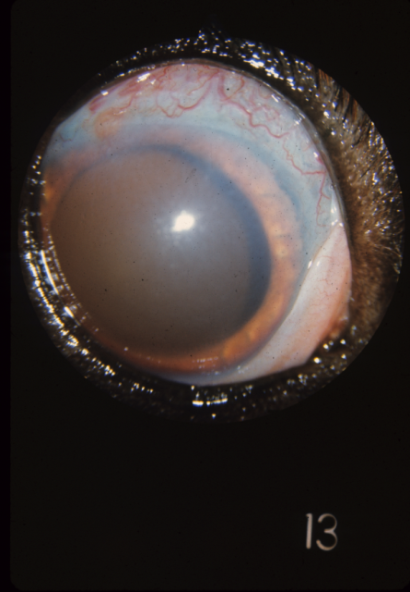 Often related to lens luxation Terrier breeds are prone to secondary glaucoma. Clinical signs alone are typically not enough to diagnosis glaucoma. Measurement of the intraocular pressure is essential, this is performed with a tonometer. In some cases, the drainage angle may be inspected with a special lens (called gonioscopy). Examination of the intraocular structures can help determine the cause of the glaucoma and also provide a prognosis for vision. Treatment will depend on many factors including the cause, how long the pet has had glaucoma and if there is a chance of vision. Pressures above 30mmHg are painful and expected to cause a level of pain similar to a migraine headache. Medical treatment (typically topical eye drops) is intended to decrease fluid production and increase fluid outflow. In most cases involving primary glaucoma the eye no longer responds to medical therapy and other treatment options must be considered. Surgical options for eyes that are still visual may include laser energy applied to the ciliary body (portion of the eye that produces fluid) to decrease production of fluid. Another option is a goniovalve, a device that shunts fluid from inside the eye to the tissue space surrounding the eye. From there the fluid is naturally absorbed by the body. Both laser therapy and goniovalve therapy can maintain vision and control glaucoma rather effectively for months to years, but are not permanent cures. Non-visual eyes might require surgery to make the pet pain-free and comfortable. The types of surgery that permanently cure painful, glaucomatous eyes include enucleation (eye removal) and an intrascleral prosthesis which is a semi-cosmetic eye in the orbit.